A big thanks to one of my first bosses for telling me this keeper – “yes, heat exchangers make air conditioning more efficient but the most efficient air conditioning is one that’s turned off” – priceless and spot on. And so in that vein we have soldiered through our hot Sydney summer avoiding the use of air conditioning in our office as much as possible, and the results are in. 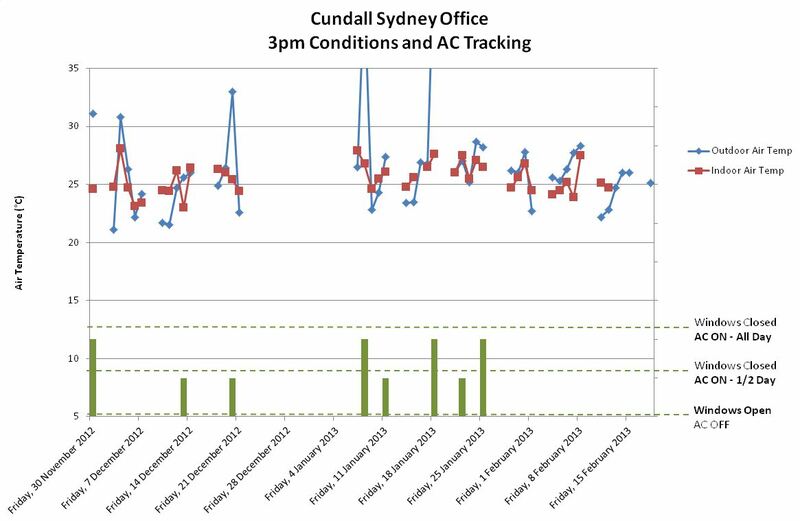 Big thanks to Toby Coates of Cundall Sydney for tracking the data. Over the last 45 working days the average outside air temperature has been 22degC at 9am and 26degC at 3pm, with a max of 46degC (Sydney’s hottest day on record!). The average temperature inside our office has been 24degC at 9am and 25degC at 3pm, with a max of 28degC. Now for people used to a esky office 24 – 25 degC office may seem hot but it’s not when its over 30degC outside it feels nice and cold. 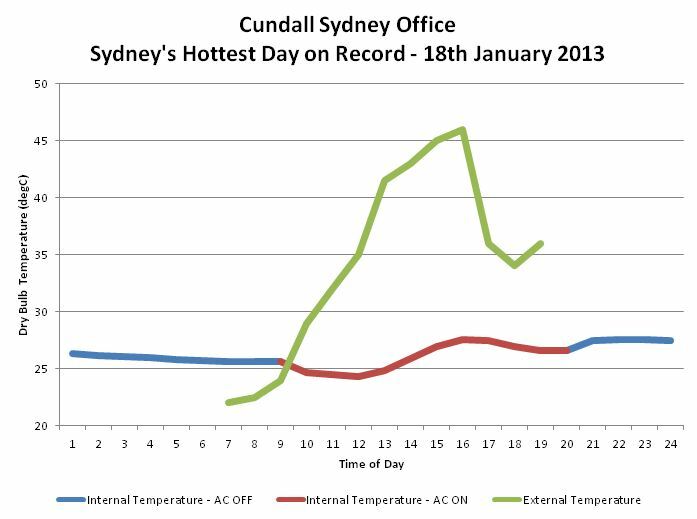 On Sydney’s hottest day on record we did have the air conditioning on but we only cooled the office to 27degC and it felt very comfortable, not surprisingly when it was some 20 degrees hotter outside. So in the 45 days of summer we have had the air conditioning on for the whole day for 4 days and on for only half a day for 6 days, totaling 10 days where we needed air conditioning – a grand total of 22%, thats 78% of the summer without air conditioning. How many air conditioning systems can show a 78% energy reduction when they are on for the whole year! All our offices in Australia are mixed mode (ie the air conditioning gets turned off and the windows open when its nice outside) and our Perth office has no air conditioning, they made a conscious choice to not install air conditioning. So next time you see 40degC on the weather chart in Western Australia please spare a thought for our Cundallites in Perth. Does increasing temperatures mean that air conditioning will be used more often – no, just adapt your expectations of comfort. Can an office in Sydney successfully operate for 80% of the year without air conditioning – yes, we just need to design and operate our buildings to allow it to happen. Is 27 degC comfortable for an office – yes, just make sure you dress for the occasion. The future of air conditioning is OFF – well for most of the year anyway!